Two years of reflection and a few seconds in zero gravity were the origins of a series of artist works that have been completed at the Yuri Gagarin Cosmonaut Training Centre in Star City, Russia. 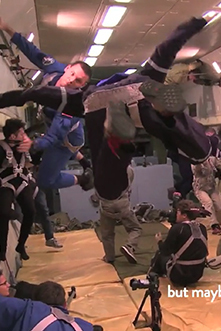 There, on board the iconic Ilyushin 76 MDK, 9 artists and 1 scientist from Mexico were subject to an environment of weightlessness. A few seconds were enough to experience eternity, to tell a story, to break a paradigm, to liberate a molecule, to have an illusion, to experience movement without references, to create poetry out of falling bodies, to make the useless become useful and to search for the impossible embrace.